Across the world, a good opportunity exists for growth of the global nicotine replacement therapy (NRT) market. According to Foundation for a Smoke-Free World based in the U.S., the global market size of the nicotine ecosystem was US$ 785.0 billion in 2017. Smoking cessation and NRT products hold a market share of 0.3% of the global nicotine ecosystem market. This presents a huge opportunity for global NRT and smoking cessation product market players for further penetration of NRT products across the world. The global smoking cessation and nicotine de-addiction market has two types of products: e-cigarettes and nicotine replacement therapy (NRT) products. During 2011 and 2012, NRT smoking cessation products such as nicotine chewing gums, nicotine transdermal patches, nicotine lozenges, nicotine tablets, nicotine sprays, and nicotine inhalers had a larger market size compared to e-cigarettes. But from 2013 onward, with rise in consumer penetration of e-cigarettes, especially in developed regions such as North America and Europe, demand for e-cigarettes sky-rocketed and the market size of global e-cigarettes increased many-folds compared to the market size of NRT products. In fact, the global market size of NRT products saw a slight decline. Millennial and young consumers used e-cigarettes as a smoking cessation product compared to NRT products such as gums, patches, lozenges, tablets, sprays, inhalers, etc. This trend is continuing till today and is expected to continue in future. From the supply side, the global smoking cessation and nicotine de-addiction market is fragmented and the market structure varies from country to country. From 2013 onward, with rise in demand for e-cigarettes across the world, the usage of e-cigarettes started increasing. Prominent companies operating in the e-cigarette market are JULL Labs Inc. and British American Tobacco (BAT) Plc. Global e-cigarette market players outsource e-cigarette manufacturing to the low-cost Asia Pacific region. Most e-cigarettes are manufactured in Shenzhen, China. The designing of e-cigarettes is done by e-cigarette market players in-house. For example, JULL Labs Inc. designs its e-cigarette products in San Francisco, California. 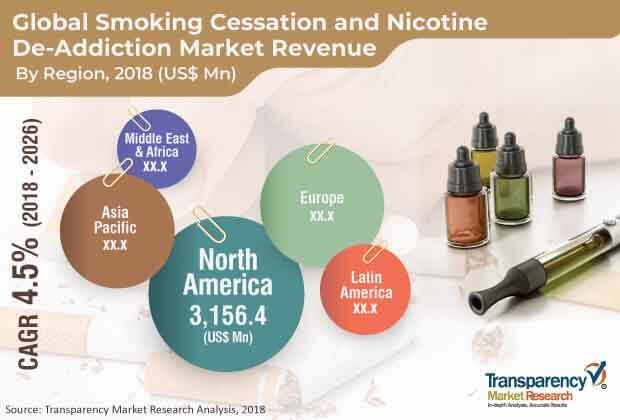 The study provides a conclusive view of the global smoking cessation and nicotine de-addiction market by segmenting it in terms of product type and distribution channel. In terms of product type, the global smoking cessation and nicotine de-addiction market has been classified into products (with nicotine) and products (without nicotine). Products (with nicotine) are further sub-segmented into OTC products and prescription products. OTC products are segmented into e-cigarettes, nicotine gums (NRT), nicotine patches (NRT), nicotine lozenges (NRT), and nicotine tablets (NRT). Prescription products are divided into nicotine sprays (NRT) and nicotine inhalers (NRT). Products without nicotine are prescription products and are segmented into Zyban and Chantix. By distribution channel, the global smoking cessation and nicotine de-addiction market is segmented into online and offline. NRT stands for products that help to reduce the urge for smoking i.e. nicotine replacement therapy (NRT). The value chain of the global smoking cessation and nicotine de-addiction market consists of e-cigarettes and nicotine replacement therapy (NRT) product designers, e-cigarette and NRT product manufacturers, and distribution channel (both online and offline). Global e-cigarette market players such as Juul Labs Inc. designs its products in San Francisco. About 95.0% of the global production of e-cigarettes happens in Shenzhen, China. The first e-cigarette manufacturer in Shenzhen was FirstUnion Group formed in 2004 which has more than 5,000 employees. Presently, there are more than 600 e-cigarette manufacturers in Shenzhen. Majority of e-cigarette manufacturers are less than 10 years old and no company dominates the Shenzhen cluster. This report on the global smoking cessation and nicotine de-addiction market provides analysis for the period 2016–2026, wherein 2017 is the base year and 2018- 2026 is the forecast period. Data for 2016 has been included as historical information. The report covers market dynamics including drivers, restraints, opportunities, and trends that are expected to influence the expansion of the global smoking cessation and nicotine de-addiction market during the said period. The study provides a comprehensive analysis on market growth throughout the above forecast period in terms of value estimates (US$ Mn) across different geographies. E-cigarettes are less harmful than conventional burning cigarettes and are seeing rising sales across the world. E-cigarettes are highly popular in developed regions such as North America, Europe, and Japan. They are being adopted even in developing regions such as Asia Pacific. According to International Tobacco Corporation (ITC), e-cigarette sales increased from 1,000 million units in 2017 to 2,000 million units in 2018, at a CAGR of 18.9%. Smokers and non-smokers across the world are gradually accepting the less harmful e-cigarettes which are expected to drive the demand for smoking cessation and nicotine de-addiction products globally. Across the world, consumers perceive e-cigarettes as “less harmful as regular cigarettes.” Consumers prefer e-cigarettes as they help them to reduce consumption of Factory Made Cigarettes (FMC). Another factor increasing the demand for e-cigarettes is that these cigarettes do not smell like regular cigarettes and do not bother people surrounding an e-cigarette consumer. E-cigarettes can be used by consumers even in areas where smoking is prohibited. E-cigarettes are available in various flavors and different nicotine levels. The cost of e-cigarettes is also less than regular tobacco burning cigarettes. The study provides a conclusive view of the global smoking cessation and nicotine de-addiction market by segmenting it in terms of product type and distribution channel. In terms of product type, the market has been classified into products (with nicotine) and products (without nicotine). Products (with nicotine) are further sub-segmented into OTC products and prescription products. OTC products are segmented into e-cigarettes, nicotine gums (NRT), nicotine patches (NRT), nicotine lozenges (NRT), and nicotine tablets (NRT). Prescription products are further divided into nicotine sprays (NRT) and nicotine inhalers (NRT). Products (without nicotine) are prescription products and are segmented into Zyban and Chantix. By distribution channel, the global smoking cessation and nicotine de-addiction market is segmented into online and offline. NRT stands for products that help to reduce the urge to smoke i.e. nicotine replacement therapy (NRT). The analysis of the above segments is based on present and forecasted global demand for smoking cessation and nicotine de-addiction products and the prevailing and future trends in the market. We have analyzed the present and estimated regional market size of smoking cessation and nicotine de-addiction products across North America, Europe, Asia Pacific, Middle East & Africa, and South America. The regional smoking cessation and nicotine de-addiction markets are further broken down into country level markets in the following geographies: the U.S., Canada, U.K., France, Germany, China, Japan, India, GCC, South Africa, and Brazil. The global smoking cessation and nicotine de-addiction market consists of global players as well as large number of medium and small players. The report includes detailed analysis of the global smoking cessation and nicotine de-addiction market, SWOT (Strength, Weakness, Opportunity, and Threats) analysis of the market, Porter’s Five Force analysis, key macroeconomic indicators influencing the market, smoking cessation and nicotine de-addiction market regulations in various geographies, and trends. The industry analysis includes value chain analysis of the global smoking cessation and nicotine de-addiction market. The report highlights major companies operating in the global smoking cessation and nicotine de-addiction market including Pfizer Inc., GlaxoSmithKline plc (GSK), Cipla Ltd., Johnson & Johnson (J&J), ITC Ltd., Takeda Pharmaceutical Company Ltd., Alkalon A/S, 22nd Century Group, Inc., Strides Pharma Science Ltd. and JUUL Labs, Inc. These market players have been profiled in terms of attributes such as description of the company, financials (if available), products, and key strategies to increase market share in the global smoking cessation and nicotine de-addiction market.